The titles of early 18th century British maps read less like titles and more like sales pitches. 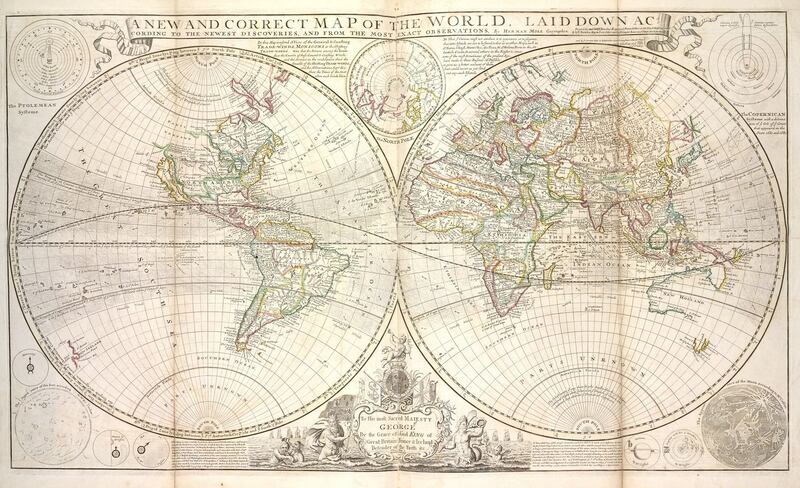 Herman Moll’s 1709 map, A NEW AND CORRECT MAP OF THE WORLD, LAID DOWN ACCORDING TO THE NEWEST DISCOVERIES, AND FROM THE MOST EXACT OBSERVATIONS, promises newness and accuracy, and yet, the details a contemporary reader notices most are the map’s conspicuous inaccuracies and anachronisms. California is represented as an island, Canada and Australia are only half-drawn, and Antarctica is absent entirely, replaced by more big block letters: PARTS UNKNOWN. As always, the map is not the territory, and its puffed-up claims to the contrary only make this inequality more apparent, even comic. Parts Unknown. Unincorporated Territory. Terra Incognita. Open Range. Tabula Rasa. Untilled soil. Hic sunt dracones. There are many ways to fill the empty space of a map, but, like the bluster of Moll’s title, these often gloss over deeper questions. 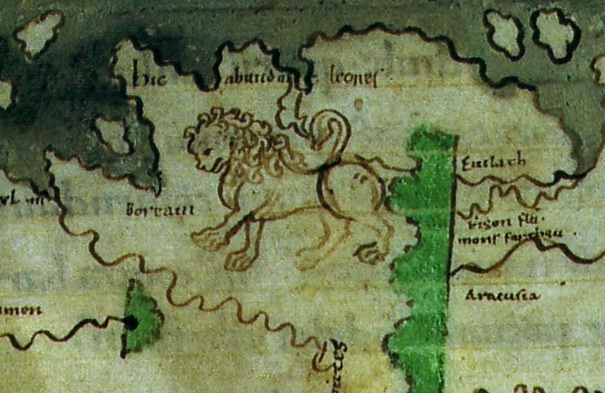 When their maps contained parts unknown, Medieval cartographers signified these spaces with the text hic abundant leones(“here lions abound”). Or maybe this metaphor is our making, and the Medieval mind truly believed any newly discovered territory could, would, should, did contain lions. Maybe it did, way back when. It’s not too much of a stretch to take this phrase at face value, but what about hic grifes (“here are griffons”), or hic panotti (men who are pan “all” + oûs “ears”), or hic cenocephali (men with kyōn “dog” + kephalē “head”)? The meanings behind this language, all language, are ultimately as unknowable as the space that language hopes to represent. It would appear that there’s no way to access parts unknown, whether we take a physical approach or a metaphysical one. We tried to take an open-ended approach to Territory’s fourth issue, our first unthemed one, which we named Open for lack of a better term. This issue is unthemed and yet most if not all of our contributors happened to write, paint, and code into and about our less determined approach, making good on our unwitting title: Open. Dennis James Sweeney explores the “limit of blankness” in Antarctica. Erika Meitner reaches from “history that predates...predawn” to “beyond the imagined / event horizon” of the future. Jennifer S. Cheng writes about phantom limbs. Mark Ehling & Stephen McClurg eavesdrop on neighbors they can’t see. Given an absence of structure, our contributors made absence their structure. Or maybe that’s just us applying our own structure to another absence. It’s impossible to say, so for now we’ll defer to you, our readers, inviting you make your own observations and discoveries in this, Territory’s newest and most exact issue. Kendra Atleework’s “Dawn of Tomorrow” is, in part, a response to a pictorial map of Forest Lawn Memorial Park, published circa 1950. The map’s text boasts that, within the Great Mausoleum, “the greatest collection of large marble statuary and the nation’s finest collection of stained glass” is found. In the Court of David “may be seen America’s only full-size reproduction Michelangelo’s heroic ‘David.’” Visitors may also find reproductions of “The Wee Kirk o’ the Heather,” an old Scottish church, and “Apollo and Daphne,” Bernini’s famous statue. 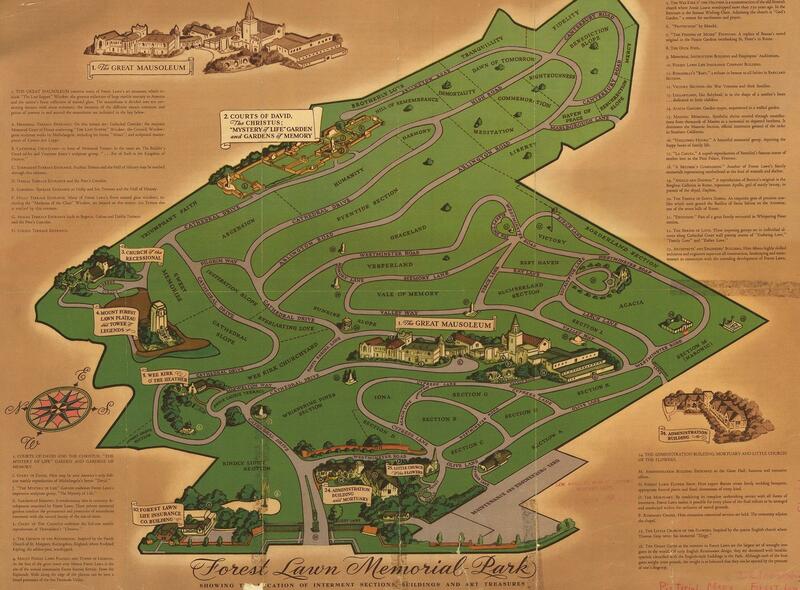 In many ways, the map advertises Forest Lawn as the Las Vegas of cemeteries. A section entitled Lullabyland, shaped as “a mother’s heart”, is dedicated to children. In addition to William Mulholland, the cemetery boasts Lauren Bacall, Walt Disney, and Clark Gable. 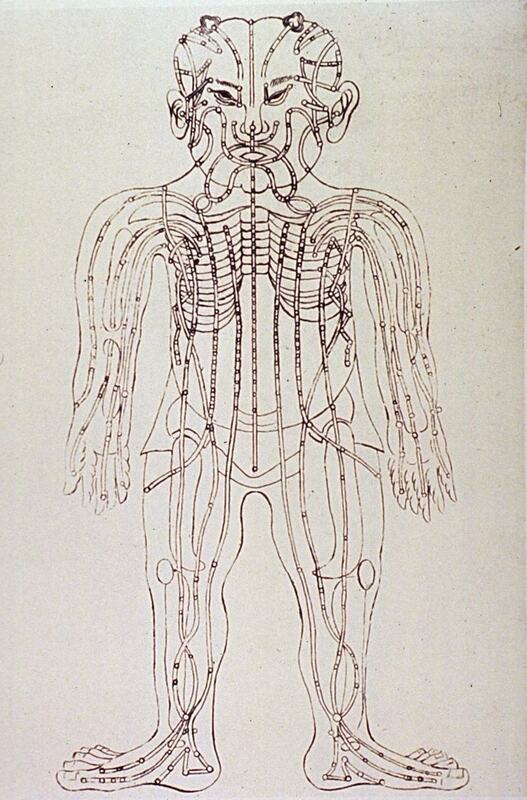 Jennifer S. Cheng’s “Towards a Poetics of Phantom Limb, Or All the Shadows That Carry Us” maps a woodcut of the human body showing acupuncture points and meridians. There are twelve principal meridians in the human body, that is pathways along which qi, or vital energy, is said to flow, as opposed to 360 meridians, or lines of longitude, that pass through earth’s terrestrial poles. The body’s meridians are: the lung, heart, pericardium, stomach, spleen, liver, kidney, small intestine, large intestine, triple burner, gall bladder, and urinary bladder. While similar Chinese woodcuts date from the 17th or 18th century, newer and chintzier versions of acupuncture charts have cropped up as the practice has become increasingly popular in the United States. Some, such as this one depicting the meridians and entry points as the New York City subway system, are available for purchase on Amazon, another pathway along which vital energy is said to flow. Patricio González Vivo & Jen Lowe’s “Guayupia” is a map for their son, along with an account of that map. Just as zooming in on the map-proper yields additional information like city names, “zoom in” on a footnote and you’ll access another layer of the “map”: Patricio and Jen’s research notes. Clastres, Helene. The Land-without-Evil: Tupi-Guarani Prophetism. Urbana : University of Illinois Press, 1995. Dym, Jordana & Offen, Karl. Mapping Latin America: A Cartographic Reader. Chicago; London: The University of Chicago Press, 2011. Ramirez, Mari Carmen. El Taller Torres-García : the School of the South and its Legacy. Austin: Published for the Archer M. Huntington Art Gallery, College of Fine Arts, the University of Texas at Austin by the University of Texas Press, 1992. 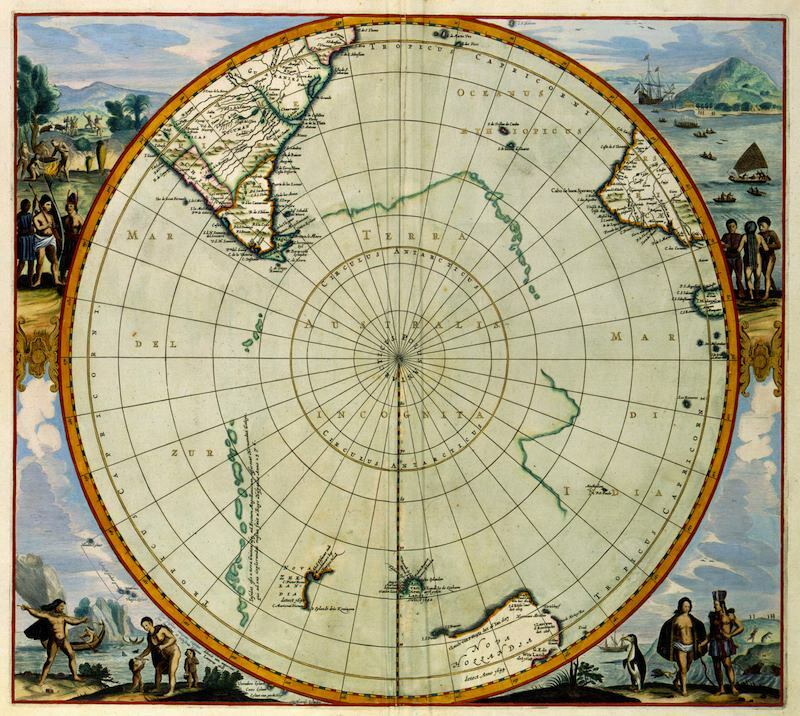 Whitehead, Neil L. "Indigenous cartography in lowland South America and the Caribbean." The history of cartography 2.3 (1998): 301-26. Like the detail of wire in no man’s land and like the name of God in “HoleyMoleyLand,” the diagram of Anne Frank’s secret annex was to remain, well, secret. World War I has turned into World War II but the concept of terra nullius remains the same. Collier Nogues’ “The Perimeter” maps the Kadena Air Base in Okinawa, Japan. While the author grew up on the base, she can no longer enter the site without military affiliation. “The Perimeter,” then, is just that: a documentation of the base’s borders through both photography and text. By tracing the base’s fence, “The Perimeter” not only explores the intersection between open and closed land, but details the fence’s transparency and porousness despite its status as a legal and territorial barrier. “A Raft Manifest” is a travelogue written by the feral twin brothers, Rem + Rom. Written in a pidgin “landgauge,” the document charts the brothers’ attempt to reverse engineer the path their father took when he was a member of the Lewis & Clark Expedition. Matthew Schmidt’s “City of Angles” & “Combing the Map Flat” are paired with a chart detailing the exoskeleton of an ant and a figure depicting the first phase of colony defense in the ant Pheidole dentata Mayr. The latter figure appears in the biologist and entomologist Edward O. Wilson’s article on The Organization of Colony Defense. 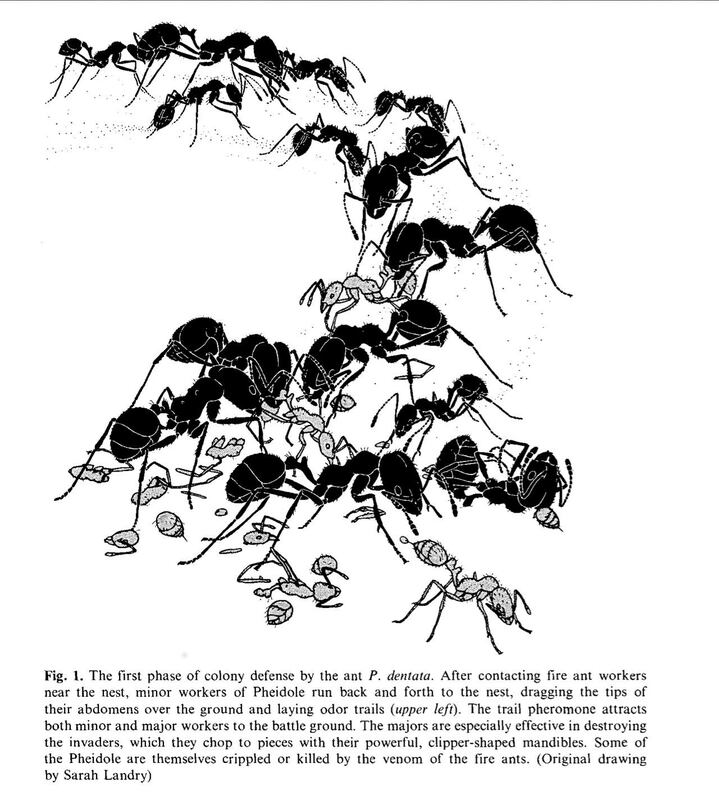 In the article, Wilson diagrams the “complex defense” Pheidole dentata colonies employ against fire ants: 1) they lay trails of pheromones to recruit “nestmates over considerable distances”, before 2) closing ranks when the fire ants invaded in number, and 3) “absconding with their brood and scattering in all directions” when the invasion threatened to overwhelm. For his achievements in both the sciences and literature, Wilson was awarded the Lewis Thomas Prize for Writing about Science in 2000, an award the editors of this journal hold near and dear. Dennis James Sweeney’s “In the Antarctic Circle” is an attempt to map the vast emptiness of Antarctica and the few human stories that can be found scattered throughout the continent. 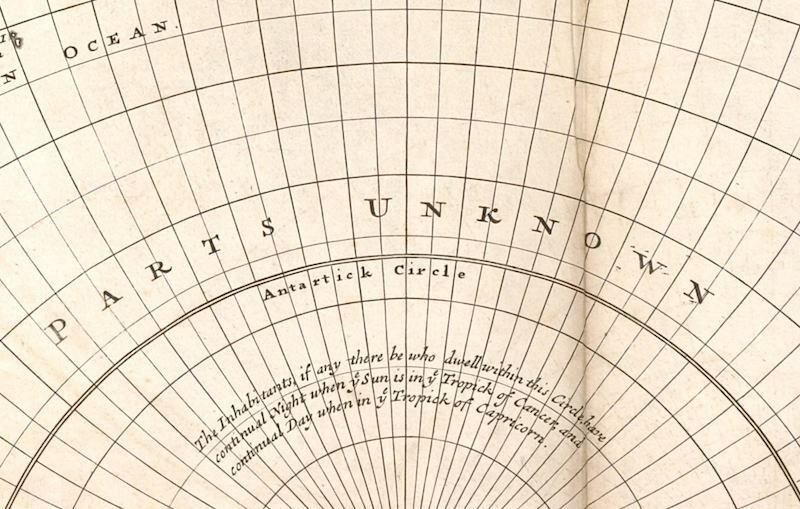 Today, we think of this emptiness metaphorically, the word ‘empty’ signifying an absence of (human) life, but older maps represented this emptiness more literally, presenting the continent as empty sea with the text Parts Unknown, as in the aforementioned Herman Moll map. Others conceived of these parts as a vast continent known as Terra Australis or Terra Australis Incognita, but lacking first-hand, complete, cartographic documentation of the continent, these maps were sketchy, as in Jan Janssonius’ 1657 map pictured here. The map we chose to pair with “In the Antarctic Circle” is from 1920, after the continent’s coastline had been well-documented, but before the interior had been explored in a meaningful way, hence the map’s tempting claim of UNEXPLORED REGIONS. In addition to the standard bio, we ask that our contributors share a location that represents them in some way. Collected together they comprise the genius loci of this issue. Return to the issue cover page, preview upcoming issues, or learn more about how you can get involved.